Being a rural location Cessnock Airport is most accessible via car or plane. Public transport is available to Cessnock from Maitland and Newcastle. You can plan your trip using this handy tool. The nearest TRAIN station is Maitland. TAXIES are available from Cessnock CBD to Cessnock Airport. Keep in mind that Cessnock Airport is 9km from Cessnock CBD. No alcoholic beverages can be brought onto the event site. No animals are permitted on the event site eg. Dogs. Automatic Teller Machines will not be available onsite. No bicycles will be permitted on the event site. There will be designated parking areas at the airport. In the event that onsite parking is at capacity, then offsite parking will be available a short distance away from the airport. A FREE shuttle bus service will operate to and from the main entrance gate throughout each day of the airshow. Limited seating in the way of hay bales will be provided for attendees to view the airshow. Visitors are permitted and encouraged to bring chairs with them. Ticket concessions are available for general admission Pension Card holders only. The Pension Card must be shown at the gate upon entry to the event. Companions accompanying Companion Card holders are eligible for a free general admission ticket (ie. excludes Gold Pass tickets) with a general admission ticket purchase. The free ticket can only be obtained at the window of the ticket office at the main entry gate to the airshow. The purchased ticket and the Companion Card must be shown to receive the free ticket. Visitors to the event should be aware that the event is not held on a purpose-built site and may pose some challenges for the very young, the elderly and those with mobility issues. Every effort has been made to make the site as accessible as possible however visitors should note there are uneven surfaces through many areas. Limited car parking for accredited state disabled permit pass holders ONLY. Event-specific disabled car passes are not required. Companion Card holders receive their ticket free (excludes Gold Pass tickets). Dogs are not permitted on the event site. A variety of food stalls will be available throughout the event site. External food including picnics will not be permitted. Official Hunter Valley Airshow merchandise will be available at the event. Mobile phones are permitted on site, however, due to network congestion, reception may not always be available. Pass outs will be available at the Main and Gold Pass entry gates. Persons leaving the event who do not obtain a pass out, will not be able to re-enter the event on the same ticket. Concession rates will be available to Pension Card holders when buying tickets online or at the main entrance gate. The Pension Card must ​be shown at the gate upon entry to the event. Scooters and Skateboards are not permitted at the event. A Seniors Card does not qualify as a concession for the event. Concession tickets are ONLY available to Pension Card holders. 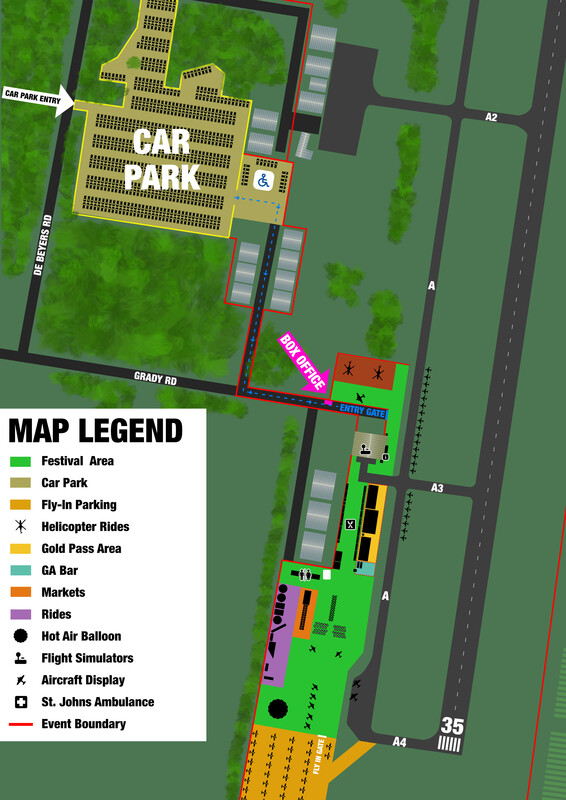 A free shuttle bus will be available throughout the airshow days running between the offsite car park and the main entrance gate. Smoking is not permitted anywhere within the bounds of the airshow area. This includes the use of electronic cigarettes (e-cig or e-cigarettes), personal vaporisers, electronic nicotine delivery systems, or other battery powered vaporisers. Those wishing to smoke will need to obtain a Pass-Out which are available at the Main and Gold Pass entry gates. Please be aware that persons leaving the event who do not obtain a Pass-Out will not be able to re-enter the event on the same ticket. NO student concessions are available for the event. Under 6 years – free. 6 years to 16 years – Child. Over 16 years – Adult. Hunter Valley Airshow general admission tickets are available in advance from the Hunter Valley Airshow website and will also be available at the gate on the day. Hunter Valley Airshow Gold Pass and Group tickets must be pre-purchased from the Hunter Valley Airshow website. Note: Savings to be had by purchasing tickets online comparable to the purchase at the gate.